During Ubisoft's E3 conference, it was revealed that Mario + Rabbids Kingdom Battle is getting new heroes, new stages, and a lot more Rabbids on June 26, when Donkey Kong Adventure, its biggest DLC to date, launches on Nintendo Switch. 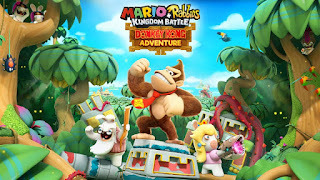 Spread across four new zones, Donkey Kong Adventure focuses on Donkey Kong and Rabbid Cranky, who team up with Rabbid Peach to fight off Rabbid Kong, who’s angrier and more powerful than ever. Donkey Kong Adventure introduces new gameplay elements, with one of the biggest being DK’s grab-and-throw skill. Giving him the ability to pick up and throw enemies, allies, explosive sentries, or even pieces of cover around the map, it opens up new ways for creative players to devastate their enemies. It’s all coming your way June 26, or a day early on June 25, if you have the Season Pass. To find out more, check out our preview.